Editors Note: This article first appeared in “Arms Collecting,” Vol. 30, No. 2 (May 1992), p. 39 – 48 and is reprinted with the kind permission of the publisher. Contrary to popular myth, the War of 1812 was not contest fought largely between Kentucky riflemen and British redcoats. Non-regular forces, including the militia of both the United States and Canada and native warriors from both countries, did play a prominent part in the conflict but only as auxiliaries. The major campaigns and battles of the war were conducted by regular forces using European doctrine and weapons including conventional field artillery. Historians of the War of 1812 have not paid much attention to the role played by the artillery arms and the following article, which is a general survey of the equipment, organization and tactics of the field artillery of the British and American armies, 1812-1815, is intended to rectify this omission. In 1812, field artillery consisted of guns and howitz­ers. Guns, often mistakenly called "cannon", were de­igned to fire their projectiles with the highest possible muzzle velocity to achieve the greatest range and the maximum impact velocity on target. They were therefore cast with long barrels that permitted the explosion of the propellant charge to act on the projectile for the longest possible time. The trajectory of a projectile fired from a gun was flatter than one fired from a howitzer, the other major artillery weapon. Howitzers were used to throw a projectile on a curved trajectory at short ranges and, since muzzle velocity was not as crucial, were manufactured with shorter barrels. Elevation of the British light 6 pdr. Gun on a double bracket field carriage from Rudyard’s Course of Artillery at the RMA. The Royal Artillery was still equipped with weapons of this type at the beginning of the War of 1812, although they were gradually being replaced by carriages of the block trail construction. Note the large side-boxes used for ammunition stowage which are mounted on either side of the barrel. Howitzers were designated by their bore diameters in inches but guns were differentiated by the weight of round shot they fired. A British gun with a 3.67 inch bore diameter was thus termed a 6-pounder (6-pdr.) from the weight of its shot. During the Napoleonic period, each nation had its own system of calibres and a Russian 12-pdr. had a different bore diameter than a Spanish weapon of the same calibre. The British Royal Artillery and the United States Artillery shared the same system of calibres consist­ing of 3-pdr. (2.91 inch bore diameter), 6-pdr, (3.67 in. ), 9-pdr. (4.20 in. ), 12-pdr. (4.62 in. ), 18-pdr. (5.29 in.) and 24-pdr. (5.82 in.). The ammunition of both nations was thus interchangeable. The most common field gun of the War of 1812 was the 6-pdr., but heavier weapons were brought into action. The U.S. artillery possessed a number of light iron l8-pdr. guns that rendered excellent service while the Royal Artil­lery in Canada fielded a pair of brass 24-pdr. guns that had originally been manufactured as experimental pieces dur­ing the reign of George II. The standard field howitzer of both nations was the light 5 ½ inch piece, a somewhat erratic weapon but one that fired a fairly heavy projectile for its size. British brass 12 pdr. On a block trail carriage of the 1840s at Westmount Park, Montreal, similar in appearance to the carriages of the War of 1812 period. Although the elevating screw beneath the cascable of this gun is not attached to it, there is a provision for its attachment on the barrel. The photograph gives a good idea of the sturdy construction of block trail equipments. All guns, regardless of calibre, were similar in ap­pearance being large metal tubes with their bores drilled out from the muzzle end. At the closed, or breech end, of the tube was a knob or "cascable" used for aiming the piece. A small passage known as the vent was drilled from the upper part of the breech down into the bore to permit ignition of the propellant charge. On either side of the tube were projections known as trunnions used to seat the gun on its carriage. Howitzers were shorter and squatter in appearance. Most European nations, including Britain, cast their field artillery in "brass," actually a bronze mixture consisting of 8 lbs. tin to 100 lbs. copper. Brass pieces were light, an important consideration for field artillery where mobility was important, but they had a limited service life and would often start to "droop" after 500 rounds. The United States cast its field artillery in iron which, although heavier, was cheaper and stronger. There were excellent supplies of high grade iron ore in America and the resulting weapons rendered good service. The bores of guns and howitzers were drilled larger than the diameters of their projectiles so that they could be loaded quickly. This difference in diameter of bore and shot was known as the "windage" and in the Royal Artil­lery was about 1/20 of the bore diameter. Although neces­sary, the windage allowed the exploding gases of the propellant charge to escape around the projectile rather than act upon it and, accordingly, reduced both velocity and range. Artillery carriages were simple in design and sturdy used the "double bracket" carriage which consisted of two substantial pieces of wood, or brackets, set on edge and parallel to one another and fastened together by cross­pieces termed "transoms". The whole construction consti­tuted a rectangular wooden framework whose rear end, or trail, rested on the ground and whose forward end was mounted on a wooden axle box supported by two large wooden wheels. The Royal Artillery used a different type of carriage known as the single block trail. The trail of this type was formed by a single shaft of wood that thickened toward the forward end of the carriage to support the weight of the barrel. The block trail placed the centre of gravity of the gun further forward, lightening the weight on the trail, making the piece easier to traverse and reduc­ing the turning circle of the carriage and limber. Block trail carriages were gradually introduced for all field pieces except howitzers and, by 1814, most R.A. field guns were mounted on them. Whatever the type of carriage, the trunnions of the barrel were positioned in two semi-circular grooves known as "trunnion holes" and securely fastened by metal hinges called capsquares that closed over the top. Beneath the breech of the gun was a large metal screw used for eleva­tion. In the case of British guns, the elevating screw was connected directly to the cascable but, on American guns, it supported a hinged wooden plate upon which rested the breech of the gun. To prevent carriages being shaken to pieces by the recoil of the piece, they were heavily rein­forced with iron strapping. When a carriage was to be moved any distance, it was coupled to a two-wheeled limber drawn by a horse team, the whole apparatus becom­ing a four-wheeled vehicle. 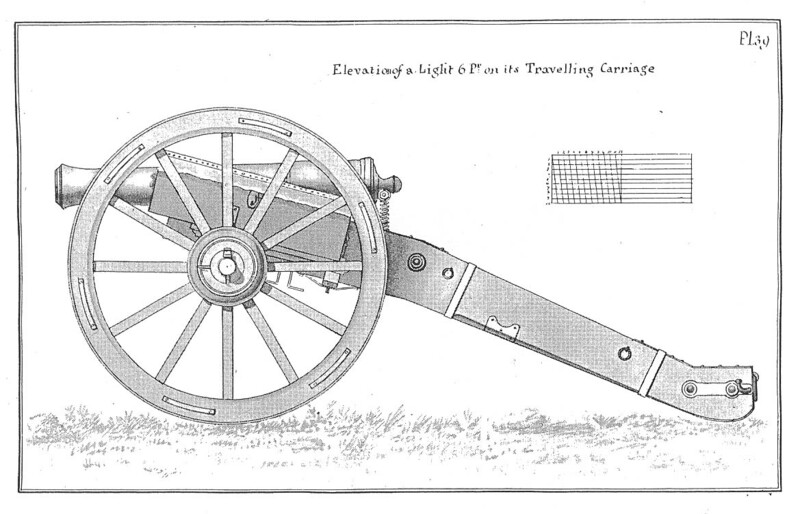 During the latter part of the 18th century, advances in metallurgy and carriage design resulted in lighter field equipments but the weight of smoothbore artillery was still considerable in 1812. The standard British light 6-pdr. and light 5 ½ in. howitzer weighed around 1,700 lbs. complete with their carriages while an American 6gun ­weighed 2,000 lbs. with carriage and an American 12­gun about 2,900 lbs. with carriage. On firing, these weapons recoiled from four to six feet and had to be "run up” or returned to their firing position by main strength before the next round was fired. Gunners of the War of 1812 had to be big, strong men - in the Royal Artillery, recruits were required to be a minimum 182 lbs. in weight ­size was needed. Smoothbore artillery fired three main types of projectiles - roundshot from guns, shells from howitzers canister from both types. Roundshot was the most important and numerous projectiles in service and, in the Royal Artillery composed approximately 70-80% of ammunition scale field. A “roundshot", sometimes incorrectly called a "cannon ball", was a solid iron sphere hammered into shape while still hot from the mould. It was used to destroy structures, men and horses. The heavier the shot, the greater its impact velocity and, thus, a 12-pdr. round was about twice as effective on target as a 3-pdr. shot. The trajectory of roundshot was fairly flat - leaving the gun muzzle, it dropped steadily until it hit the ground on "first graze" and then ricocheted and continued on to its "second graze" at which point some 80% went on further. Throughout most of its flight, the shot was below height of a man, skimming, grazing and bouncing until energy was spent. One characteristic of roundshot was that, when it bounced along the ground, it often appeared to be moving slowly. Unwary soldiers sometimes tried to stop it with their feet only to suffer an amputation as clean as that performed by any surgeon. Another characteristic of roundshot and, indeed, of all smoothbore projectiles was that they were sometimes visible during their flight and, given the tactics and formations used during the war, this meant that the intended targets had no choice but to stand still and observe their approach with great interest. 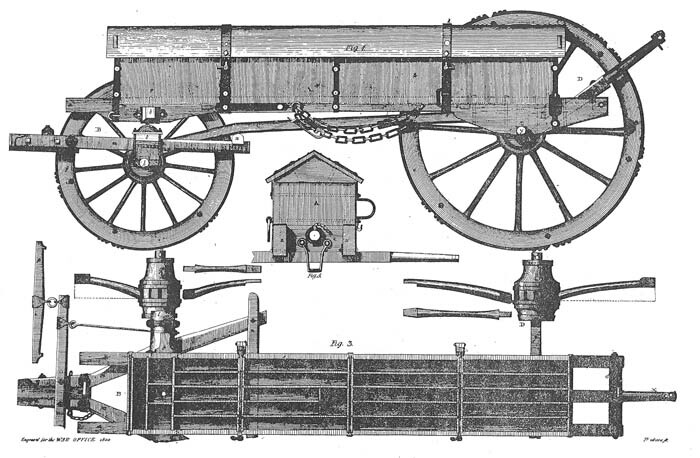 An ammunition wagon of the type used by the American artillery of the war from DeScheel’s Treatise of Artillery. Although the chest was removable from the chassis, it was usually left in place. Two chests of this type, without the chassis, have recently (as of 1992) been located in the Niagara area. A human target could use this characteristic to ad­vantage as happened with Brigadier General Winfield Scott at Fort George in July, 1814. Scott observed a shell being fired from the fort and, holding up his sword as a gauge, calculated that it was coming directly at him. Put­ting spurs to horse, he galloped to safety as the shell exploded on the exact spot he had hurriedly left. Such mobility was the prerogative of the mounted officer, the common soldier had no choice but to maintain his position, hold his breath, and pray. 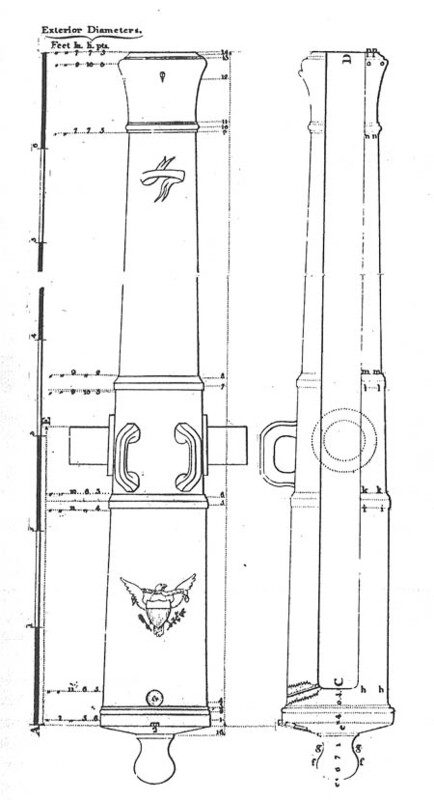 Plan and section of a 12 pdr, gun from Tousard’s Artillerist’s Companion. This drawing shows clearly the construction of a gun of the War of 1812 period. Note the position of the trunnions and the vent. It should also be noted that Tousard illustrated the ordnance that he wanted to see in service, not that ordnance that actually was. Roundshot had a fearsome effect on humans. Tests conducted during the period demonstrated that, under op­timum conditions, a 12-pdr. roundshot would, at a range of 600-700 yards, penetrate 36 human beings or eight feet of compacted earth while a 6-pdr. shot would cut through nineteen men or seven feet of compacted earth. Unless fired obliquely or in enfilade, roundshot was less effective against troops in line as it would only kill two or three men but, against troops in close .formation, a single shot might kill or wound a dozen or more soldiers. The advantage of roundshot lay in its long zone of effectiveness which made it a useful projectile against targets as close as 250 yards and out to 1,100 yards or more. The disadvantage of roundshot was that it required a high muzzle velocity and its flat trajectory meant that it could not be fired over the heads of friendly troops. This latter disadvantage was partially rectified by howitzers firing a different type of projectile - shell. "Shells" were hollow iron spheres with thin, brittle casings filled with gun powder and exploded by a fuse at a prede­termined time. The fuse was a wooden plug inserted into the shell with a train of powder in its hollow core; the time of burning of the fuse was adjusted before loading by punching a hole in one of a series of recesses in the fuse that were graded with various times of flight. The shell was loaded with the fuse resting against the propellant charge and the flash of the propellant ignited the fuse. The effec­tiveness of the shell depended on the correct cutting of the fuse and this required a careful and experienced eye on the part of the howitzer commander. Period German tests showed that, at 800 yards range with 25 degrees of eleva­tion, approximately half of the howitzer projectiles fired fell in a rectangular area of about 60 by 120 feet. These same tests also indicated that a light howitzer shell, when it burst, disintegrated into between 20 and 30 jagged metal shards that frequently flew as far as 250 feet from the point of bursting. Shells were not as effective or as reliable as roundshot but shell-firing howitzers could fire over the heads of friendly troops and search the reverse slopes of hills. For these reasons, one howitzer was usually included in the equipment of the field batteries of most nations. A third type of projectile fired by both guns and howitzers was "canister" or, as the R.A. termed it, "case shot". Canister, as its name implies, was simply a tin container filled with small lead bullets. On firing, the tin casing disintegrated, spraying a shower of lead in front of the gun position. Canister was used against advancing infantry with deadly effect - it has been calculated that a single salvo of canister by a battery of six 6-pdr. guns nearly equalled the effect of a single musket volley by an entire infantry battalion. Moreover, because of the highly concentrated spray of bullets, approximately 50% of the canister balls could be expected to find their target, a rate of accuracy far better than that of infantry musketry fire. A projectile used only by the Royal Artillery was "spherical case" commonly called shrapnel after its inven­tor, Lt. Henry Shrapnel, R.A. Introduced into service in 1804, shrapnel was a shell loaded with lead bullets as well as powder and exploded by a fuse. If the fuse was set properly and the shrapnel burst at the correct point on its trajectory, the bullets continued to travel along the path of the trajectory downward onto the target. If the shrapnel round burst too high in its trajectory, the bullets lacked hitting power when they struck; if too low, the effect of shrapnel was restricted in its target area. The major problem with shrapnel was that, from the gun posi­tion, it was difficult to judge by the explosion of a round whether or not the fuse had been cut properly and that the round was on target. During the war, the ammunition scales provided to each gun or howitzer allowed for between 60 and 90 minutes of firing. British field artillery ammunition was distributed between the ready-use axle boxes on the car­riage of those weapons equipped with them, or in boxes on the two-wheeled limber, and in the reserve ammunition wagons. A Royal Artillery light 6-pdr. gun was supplied with eight roundshot in its axle boxes and 32 roundshot, five heavy and five light canister rounds in the limber box, with 92 roundshot, heavy and light canister rounds and twenty shrapnel rounds in its ammunition wagon. British guns larger than 6-pdr. calibre and howitzers were not equipped with axle boxes and carried their ready-use ammunition in the limber boxes. The United States artillery using double-bracket carriages of the French Gribeauval pattern, had a different system of storage. Ready-use ammunition was placed in a chest mounted between the brackets of the trail and removed when the gun went into its firing position. Reserve ammunition was not carried on the limber but in a four-wheeled ammunition wagon correctly termed a "caisson". American 6-pdr. guns well supplied with eighteen roundshot in their ammunition chests while 62 roundshot and 30 canister rounds were carried in their caissons. In addition to conventional weapons, the Royal Artillery also possessed the Congreve rocket. The product of the inventive genius of William Congreve the younger, this projectile was a military adaptation of the civilian skyrocket, then as now, the mainstay of fireworks display. First introduced in 1805, there were ten different calibre in service by 1814 ranging from large explosive rocket designed to destroy buildings down to 6-pdr. rockets for field service. The most popular calibres for use in the field were 12 and 18-pdr. calibres which used an 6-pdr. shot or shell as a warhead or a 9-pdr. shot or shell respectively as well as a shrapnel warhead. At its lower elements, field artillery was organized into brigades in the R.A. and divisions in the U.S. Artillery. Both terms were equivalent to the modern term "battery” which will be used here. R.A. batteries consisted of five guns of the same calibre and one howitzer while American batteries consisted of six pieces - either four guns of the same calibre and two howitzers or six guns of not more than two calibres. It should be stressed, however, that the theoretical and actual organization of American field ar­tillery were two very different things. Each British artillery piece was accompanied by one ammunition wagon while, in U.S. service, each 6-pdr. gun was allotted one caisson, with howitzers and guns larger than 6-pdrs. being provided with two caissons. All of these vehicles as well as a number of others such as spare wheel carts, forge carts, etc., were drawn by horses, the grain-fuelled prime mover of the time. Artillery units re­quired a great number of horses - the allotted establish­ment of an RA. 6-pdr. battery on foreign service in 1813 was 81 animals. These horses were excellent targets and a battery could quickly become immobilized through the loss of animals. Gun detachments consisted of two types of soldiers: trained gunners and less-qualified men called servants in the RA. and matrosses in the U.S. Artillery. The gunners aimed, loaded and fired the piece while the others assisted by bringing up ammunition or helping to move the gun. Gun detachment commanders were usually N.C.O. 's who supervised the work of the detachment, personally laid the gun, observed the fall of shot and made the necessary corrections. Artillery officers commanded batteries of six to eight pieces or sub-units of two or three weapons. The gun detachment for a U.S. 6-pdr. field gun comprised the gun commander, two trained gunners and six matrosses. U.S. howitzers had a similar complement but four more matrosses. R.A. gun detachments consisted of a gun commander and two trained gunners for each field piece and a number of servants varying from six to ten depending on the calibre of the weapon. When additional muscle power was required, it was the practice in both armies to obtain unskilled labour from the nearest infantry unit. All fire was direct fire. Artillery could not be ordered to engage targets it could not see and was therefore re­stricted in its range to the limits of human vision which, in the smoke-filled conditions of the Napoleonic battlefield, was often very limited. As a general rule, the maximum range of light guns was about 1,000 yards while heavier piece reached out to about twice that distance. The max­imum effective range, however, was considerably less. Given the inherent inaccuracy of the smoothbore gun which had no rifling to impart a stable trajectory to its projectiles, horizontal displacement of the trajectory was very marked at ranges over 800 yards. The maximum range for howitzers was between 1,000 and 1,400 yards but their maximum effective range was around 800-900 yards for the light calibres. British practice was to fire shrapnel or roundshot at ranges over 600 yards. As the range decreased, the guns would switch to roundshot at around 600 yards and how­itzers to shell. At 350 yards, both types would use heavy canister and, at 250 yards, light canister. American prac­tice, based on French manuals, was somewhat different. At ranges over 600 yards, guns fired rounds hot and howitzers shell but, at between 500 and 600 yards, both weapons would switch to heavy canister and, at around 250 yards, to light canister. Because all fire was direct fire, gun positions had to be carefully chosen so that concentration of fire could be achieved and the enemy kept in view as long as possible. The choice of a firing position was crucial and British and American artillery manuals of the period emphasized this as being a field artillery commander's most important responsibility. The best positions were those that would subject the ground over which an enemy must advance to enfilade or oblique fire and, hopefully, crossfire from two or more batteries. Large caliber artillery pieces were placed so that an enemy could be observed at a distance to permit their superior range to have effect for a longer period. Elevation was desirable but had to be watched carefully lest height interfere with projectile trajectories - the suggested elevations were 16 yards of height to 200 yards of range and 30-40 yards of height to 600 yards of range. Ideally, guns were positioned where they could support the infantry without inconveniencing both arms. For this reason, positions in front of, or between, infantry formations were frowned on. One American manual de­scribed the proper positioning of artillery as being like that of a bastion with a good field of fire placed along a fortress wall composed of infantry. Artillery accompanied the infantry when it moved but did not necessarily align with it. When a battery came into its firing position, the pieces were unlimbered, the ammunition made ready and the limbers and caissons, or ammunition wagons, removed to a safe distance. American practice was to place the limber and ammunition chest 25 yards and the caisson 50 yards to the rear of the gun while reserve caissons were kept 250 yards the rear. Royal Artillery practice was to place the limbers 25 yards and the ammunition wagons 50 yards from the rear of the gun. The guns were usually positioned between 36 and 60 feet apart. This spacing was maintained so that limbers and horse teams could easily and quickly move around the guns should a change of position become necessary, to minimize the danger should the ammunition at one gun explode through accident or enemy fire and to keep enough distance so that the noise of the discharge of one gun did not drown out the commands being shouted at an adjacent piece. If artillery officers knew that action was imminent, they usually loaded on the move, fixing the priming wire down the vent to hold the cartridge in place. Fire was by rotation, one gun in a battery firing after another. This was done for a number of reasons: the target could be kept under a constant rate of fire; safety was easier to maintain; smoke was reduced to a minimum and there was always a loaded weapon to take advantage of opportunities. Should it be necessary to move the gun the gun detachment either manhandled the piece with special harness or, for swifter movement, the horse team but not the limber, was attached to the piece by means of a rope known as a prolonge. If the gun was to be advanced it was usually loaded on the move; if it was to retreat, it was always loaded before being moved. Artillery officers had a great deal more independence and responsibility than their infantry counterparts of equivalent rank. Having made the crucial selection of a position, the artillery officer usually had the freedom to choose his target. Given the long loading, laying and firing sequence of smoothbore artillery and the fact that the target was often obscured by the smoke of its own fire, it was a difficult task to keep a moving target under contin­uous fire. Although an artillery officer was allowed con­siderable leeway in target selection, there were some rough rules of thumb. Mass infantry formations that could be raked obliquely were the choicest targets, followed by direct frontal fire against similar formations while infantry in line came a poor third. Counter battery fire against enemy artillery was discouraged as guns were difficult targets. British gunners were enjoined never to "fire against artillery, unless the enemy's troops are covered and his artillery exposed, or unless your troops suffer more from the fire of his guns, than his troops do from yours.” Obviously, the first choice of a target would be infantry attacking the gun position. No matter how desperate the situation, both British and American gunners were advised never to abandon their weapons "till the last extremity" as the final rounds "are the most destructive; they may per­haps be your salvation, and crown you with glory." Aiming or "laying" a smoothbore artillery piece was partly art and partly science. The piece was traversed (or aligned in the horizontal plane) by means of handspikes fitted into the trail until the line of sight from the top of the breech through the sighting notch at the top of the muzzle was on target. The piece was then elevated (aligned in the vertical plane) by means of the elevating screw. In the heat of battle, the elevation chosen was usually a matter of judgement on the part of the gun commander although, if there was time and a need for accuracy, he might consult a range table. Because the line of sight was not exactly parallel to the axis of the bore, the gun commander would then calculate the tangential elevation required to com­pensate for the drop of the projectile in flight. By the time of the war, most nations were making use of a tangent sight, a moveable crossbar fixed to the breech of the gun and used in conjunction with the foresight on the muzzle to arrive at the correct tangential elevation. Experienced gun layers automatically took into account and made al­lowance for such factors as air temperature, wind direction and velocity, humidity, situation of the target and the elevation of the gun position. The gun itself was also a factor to be considered as older weapons with worn bores would have more windage and less velocity and would thus require extra elevation. Finally, the personal experience and skill of the gun layer was essential in judging the "fall of the shot" and making the corrections necessary to lay the round on target. In the smoothbore period, good gunlaying was a combination of technology and technique that required an experienced eye. The firing sequence for all smoothbore guns was similar. After a round had been fired, the "spongeman" (who stood at the muzzle) swabbed out the bore to extin­guish any burning fragments of cartridge with a sheepskin sponge mounted on a long pole. The cartridge, a flannel or serge bag containing the propellant charge, was then in­serted into the muzzle by the "loader" who stood on the other side of the muzzle. The spongeman rammed the cartridge down the bore with a rammer mounted on the other end of his pole. As the cartridge was rammed home, the "ventsman", who stood at one side of the breech, "thumbed" or blocked the vent with a leather thumbstall to ensure that the force of air caused by the ramming of the previous round and cause the premature explosion of the cartridge, an occurrence that would cost the spongeman one or perhaps both of his hands. When the charge was seated in the breech, the vents­man "pricked" it by jamming a brass priming wire down the vent to open the cartridge and make ignition certain. He then inserted a thin tube containing a trail of mealed powder into the vent. In the meantime, the loader inserted the projectile into the muzzle and the spongeman rammed it home. The gun was now ready to fire and the command being given, the "firer" on the other side of the vent ignited the tube with a portfire, a paper tube impregnated with powder which burned for half an hour and was lit from a linstock or slowmatch kept burning on the gun position throughout the action. After the round had been fired, the spongeman swabbed out the bore and the whole process began again. Firing was a complicated and dangerous business and great care had to be exercised to prevent accidents. R.A. officers were instructed to "prevent Hurry as a brave man may be so confused thereby as to prevent his doing his Duty with Spirit and may even throw him into a Panic." U.S. artillery instructions directed officers to fire the guns slowly, calmly and methodically so that the gun detach­ments will "assume a tranquil and intrepid countenance in the heat of an engagement, and perform their duty with alacrity." The rate of fire was kept low both to maintain the safety of the gunners and to conserve ammunition. While tests demonstrated that light field guns such as a 6-pdr could be fired up to three times a minute, the permissible maximum was kept to two rounds per minute for light gun and one round for heavier pieces. Higher rates of fire also meant that a gun might become overheated and the vents hot that, when the tube was inserted, it would ignite and prematurely "cook off' the round to the great distress of the gunners at the muzzle of the piece. Based on actual records of ammunition fired in battle (and guns only fire at profitable or menacing targets), the standard rate of fire for light artillery was about one round per minute while heavier pieces, which took longer to be run up from their recoil positions, fired at about half that rate. Congreve rockets were fired from a trough supported by a tripod. The apparatus was pointed in the direction of the enemy and the rocket ignited. The rocket would remain motionless emitting a fiery contrail until it acquire enough momentum to become airborne and its after blast often burned the rocket gunners before they could get clear causing them to "exhibit a strange appearance" with "no hair on their heads and their hands and shoulders severely scorched." Congreve rockets had substantial ranges, the lightest calibres could achieve between 1,000 and 2,500 yards, but almost no accuracy as they were not fin-stabi­lized and the launching stick, mounted off centre, acted as a drag on their flight. As one observer remarked, rockets were useful if one wanted to hit a city "somewhere or other, and no doubt set fire to the town; but the part of the town you could not very well choose." The Congreve rocket also had a distressing habit of doubling back on its trajectory and landing near its launching platform, a source of much anxiety to rocket gunners. Against inexperienced troops, however, rockets with their spectacular fiery con­trails could achieve very good results as happened at the battle of Bladensburg in 1814 where they put to flight a large force of militia. Veteran troops, however, regarded Congreve's invention as amusing annoyances and one American officer who had been bombarded by rockets called them "a poor contrivance for killing men." How effective was field artillery of the War of 1812? During this time, most nations conducted theoretical ex­periments with different projectiles using various charges and the results of these theoretical tests have often been taken as evidence of the actual lethality of artillery. Under battlefield conditions, however, with vision restricted by smoke and the placement of friendly troops, confused circumstances, and an intelligent and animate enemy, these theoretical results proved to be optimistic. Perhaps the most useful analysis of artillery effectiveness during the Napoleonic period is by B.P. Hughes who, having examined the role of the R.A. in three Peninsular battles, calculated that approximately 60% of the rounds fired at normal fighting distances took effect and that, overall, a properly-handled artillery piece could inflict an average of between one and two casualties for every round fired. But this calculation has to be tempered with the knowledge that, in North America, the opposing forces rarely brought enough infantry into action to provide the kind of targets that created the rate of lethality achieved by artillery in European battles. In addition, neither Britain nor the United States deployed enough artillery to form the massed batteries that were strong enough to smash a hole in the enemy's line and which were a feature of combat in Europe. In North America, field artillery functioned mainly in a support role rather than as an independent arm. Although it had a major influence on the outcome of such engagements as Stoney Creek, Crysler's Farm, Chippawa, Lundy's Lane and Bladensburg, it did not dominate the battlefield as it did in Europe. The War of 1812 was primarily an infantryman's war. William Dunlop. Tiger Dunlop' s Upper Canada. Toronto, 1967, p. 40. United States National Archives (hereafter NA), Record Group 107, Micro 221, Reel 58, Wadsworth to Armstrong, 2 March, 1813. William E. Birkheimer, Historical Sketch of the Organization, Administration, Materiel and Tactics of the U.S. Artillery New York, 1884, p. 260-261. John Muller, A Treatise of Artillery, London, 1780, reprinted Bloomfield, 1977, p. 40. Louis Tousard, American Artillerist' s Com­panion, or, the Elements of Artillery. 3 vols., Philadelphia, 1809­ - 1813, I, p. xxii-xxiii. For construction of American field artillery carriages, see Henri Othon De Scheel, Treatise of Artillery. Philadelphia, 1800, re­printed Alexandria Bay, 1984. On British carriages, see Adrian Caruana, "The Introduction of the Block Trail Carriage", Arms Collecting, 18, no. 1, 3-16 and Donald E. Graves, "A Note on British Field Artillery Equipments of the War of 1812," Arms Collecting, 20, no. 4, 127-129. Weights of British artillery from Robert Wilkinson-Latham, Brit­ish Artillery on Land and Sea, 1790-1815. Newton Abbott, 1973, p. 89. Weights for American artillery derived from Tousard, I, p. 193 and J.J.B. Gassendi, Aide Memoire a l' usage des Officiers d'Artillerie de France,(3rd ed., 2 vols., Paris, 1801, p. 1,288. William Congreve, The Details of the Rocket System London, 1814, reprinted ()ttawa, 1970, p. 21. B. P. Hughes, F irepower. Weapons Effecti vene ss on the Battlefield, 1630-1815 London, 1974, p. 32. Buffalo & Erie County Historical Society, Memoir of Jarvis Frary Hanks. Anton Dolleczek, Geschichte der OesterreichischenArtillerie. Vi­enna, 1887, p. 319. Von Pivka, p. 46. Although he does not state so, von Pivka probably quoting here from either Gerd von Scharnhorst's Handbuch der Artillerie 3 vols., Hanover, 1801-1814 or Militaerisches Taschenbuch zum Gebrauch in Felde Helwig, 1794, London, 1811. Von Pivka, 48. Same comments apply as in note 12. R. W. Adye, The Bombardier and Pocket Gunner London, 1813, p. 6. Ibid, p. 6, 7, 13. Amos Stoddard. Exercises for the Garrison and Field Ordnance together with Manoeuvres of Horse Artillery. New York, 1812, p. 35. D.E. Graves. Sir William Congreve and the Rocket’s Red Glare. Bloomfield, 1989, p. 17 – 23. Adye, p. 71. Ordnance Department regulations, 1 May, 1813 in "Register and Rules and Regulations of the Army for 1813" in American State Papers, Military Affairs, Volume 1. These regula­tions were in effect until the end of the war, see regulations for the Ordnance Department in The Army Register of the United States. Boston, 1814, p. 74. Adye, p. 71. Ordnance Department Regulations, 1 May, 1813. Adye, p. 71 – 73. Adye, p. 123. Wilkinson-Latham, p. 62 – 65. B.P. Hughes. Open Fire. Artillery Tactics from Marlborough to Waterloo. Chichester, 1983, p. 13. Adye, p. 15 – 20. Tousard, p. 113 – 115. Adye, p. 15 – 16. Stoddard, p. 51. Philip Haythornthwaite. Weapons and Equipment of the Napoleonic Wars. Poole, 1979, p. 71. Adye, p. 20. Tousard, I, p. 115. Adrian Caruana. “On the Aiming of Artillery,” Arms Collecting, Vol 18, no. 3, p. 86 – 91. Haythornthwaite, p. 61. The loading and firing procedures for artillery was basically the same in all armies and differed only in the placement of the various gun numbers around the piece. The United States following French practice, placed the ventsman on the right of the breech. “Instructions for the Management of Battalion Guns,” in Adrian Caruana. 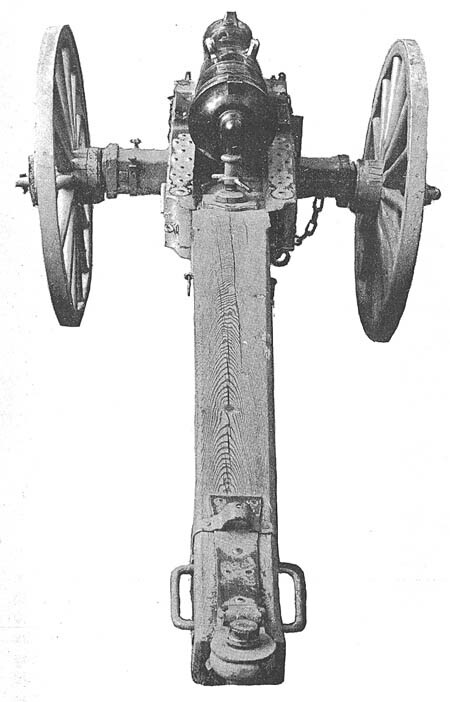 The Light 6-Pdr Battalion Gun of 1776. Bloomsfield, 1977, p. 22. Hughes, Open Fire, p. 16. David Yarrow, ed. “A Journal of the Walcheren Expedition 1809,” Mariner’s Mirror, vol 61 (1975), p. 188. G. Larpent, ed. Private Journal of Judge Advocate Larpent. 2 vols. London, 1854, I, p. 355. John C. Fredriksen, ed “Chronicle of Valor: The Journal of a Pennsylvania Officer in the War of 1812,” West Pennsylvania Historical Magazine, no. 3 (1984), p. 275.